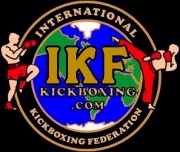 IKF CALIFORNIA - CLICK HERE! Danny Ramirez has been issued a 45 day medical suspension due to KO until August 6th, 2014. FULL RULES - KNEES TO THE BODY AND *HEAD (*) With Approved Elbow Pads. Winner: Eric Fore By KO at 1:31 of Round 1. Charlie Morreo has been issued a 45 day medical suspension due to KO until August 6th, 2014. Winner: Alyshia Madison by Unanimous Decision. Dr. Gamboa has placed a 180 day Medical Suspension on Perry due to an an ACL Injury until December 21st, 2014. IKF has suspended Perry until they are informed which Record is true? 6-21-14, San Diego, California: Dr. Gamboa has placed a 180 day Medical Suspension on Mitsunori due to an Injury until December 21st, 2014. Can be cleared by MD with IKF.